As much as I love my new digital SLR camera – it’s big and not easy to travel with by the time I pack some additional lenses, flash, etc. For a woman, carrying a utility camera bag with a purse is not fun which I discovered when I took my camera to a restaurant Saturday. As useful as my Caselogic bag is, it just clashed with my outfit and made extra baggage to lug around. Plus it kind of looks like a lunch box. So my great search started for one bag that could double as a stylish purse and protective DSLR bag. I gotta say, it wasn’t easy! There are a lot of options for ladies, but most are either super pricey ranging from $160 to $300 and/or not vegan being made of leather. 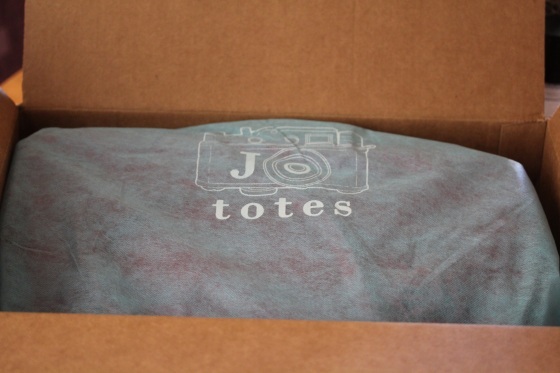 I was getting pretty frustrated until I came across Jo Totes where all bags were a reasonably priced and vegan made out of faux leather. 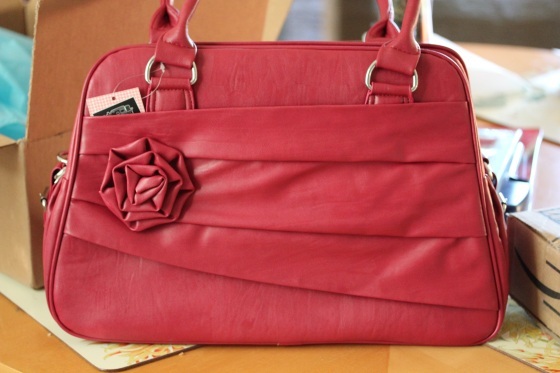 I ordered the Rose-Raspberry for a fun spring/summer bag and a few days later it was on my front porch. The interior walls are lined with Velcro and it came with 4 padded foam divider walls you can arrange however you please. I instantly started arranging it to pack my external flash, standard, telephoto and macro lenses along with my camera and it fit all of them with room to be a purse too! Yes, it’s big. But not overwhelmingly big and the long strap is long enough to wear cross body if you’d like. The quality seems pretty good, it supports the weight of the camera and lenses nicely and has a very padded bottom the equipment sits on. I wouldn’t try loading it with a laptop and a bunch of other additional heavy gear though. I’m pretty excited about this bag and want to plan a weekend road trip just so I can take it! For some reason I’m always more laid back about meals on Thursdays, I guess I’m a little burned out from the week, running out of fresh food and looking forward to the weekend. That laid back mood is contagious to my cats apparently. 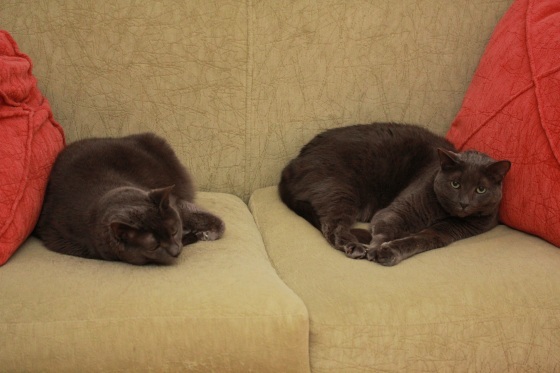 Wait, they’re always laid back – rough life. I did try more Vega in my smoothie this morning with pineapple chunks and frozen berries and liked it a little more than yesterday. But I need to order more Sun Warrior protein powder because hubby was not impressed with the Vega powder. 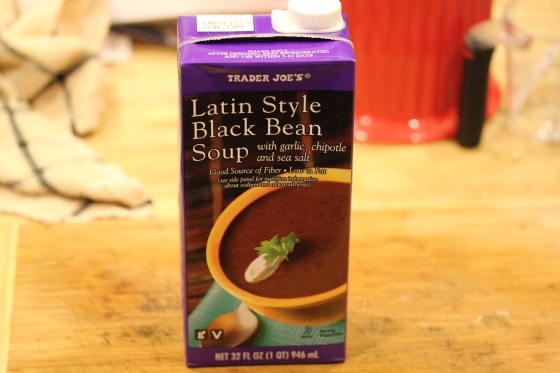 For dinner I dug one of my favorite lazy menu items from my pantry, Trader Joe’s Latin Style Black Bean soup. Just heat on the stove top and good to go. 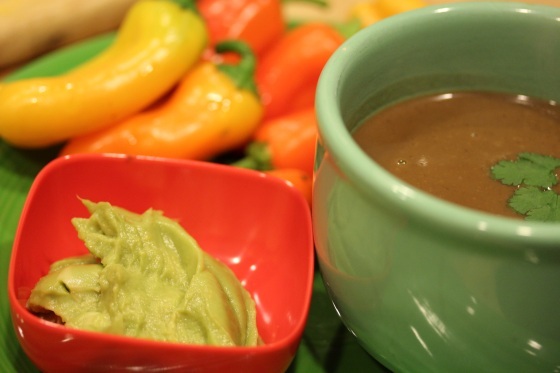 I paired it with mini sweet peppers and guacamole for a pretty, but lazy, dinner. 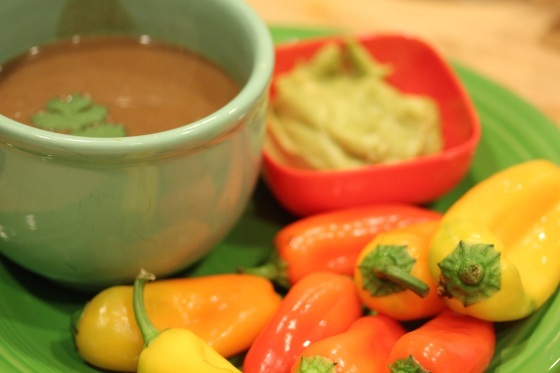 I got the peppers at Costco and they’re great snack-sized sweet bell peppers perfect for dipping in guac, hummus or slicing and jazzing up a salad. That is the BEST bag I’ve ever seen!!!!!!! Thanks, me too! :-) What’s your favorite vegan purse brand? So many! But Queen Bee are really great. ah, kitties are so lazy! and i love that bag! how gorgeous! 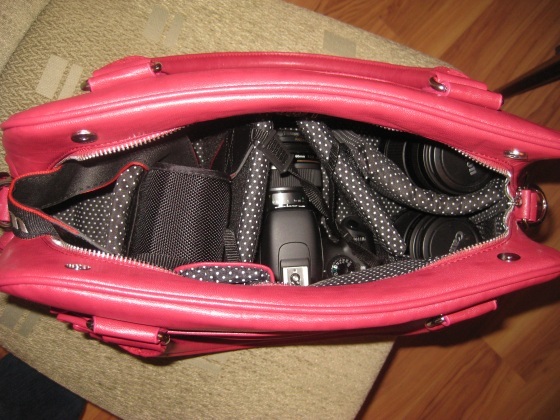 and what are the odds that we both posted about our dslr camera bags…on the same day??! Wow!! I seriously would have pegged you to get a much more neutral color, i.e. beige, tan, brown, black and am LOVING that you picked pink (raspberry) !!! ANd it looks super protective. Probably more so than mine. Great find! 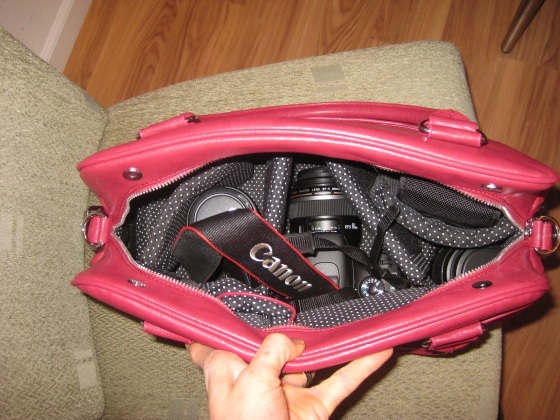 Man– everyone has such cute, snazzy camera bags!!!! I’m super jealous! 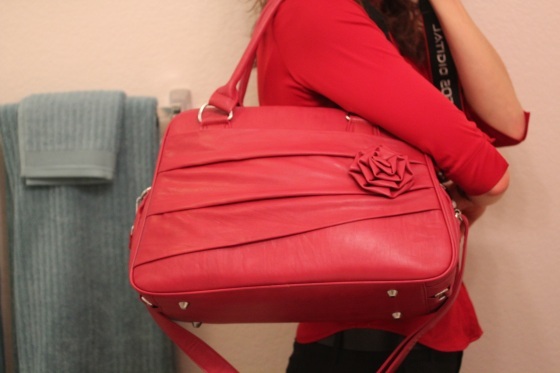 Gah, I die for that bag! Heres a couple of my fav purse brands.